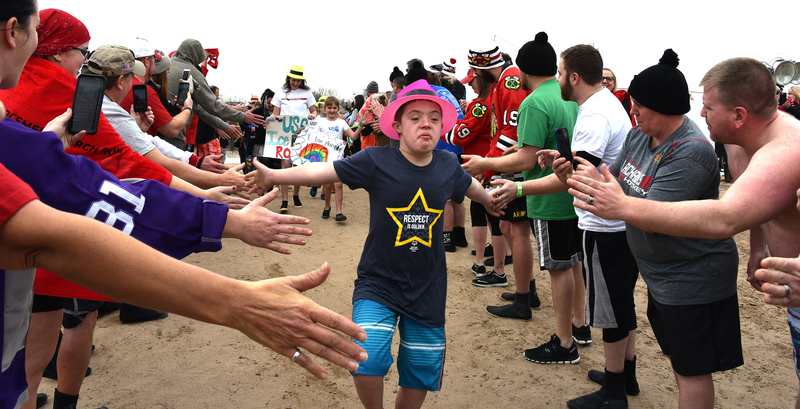 Special Olympics Illinois kicked off its 2018 Plunge season on Feb. 16 with more than 50 SUPER Plunge registrants taking a dip into icy Lake Michigan once an hour for 24 hours at Clark Street Beach near Northwestern University. “It compares to nothing else,” said Dan McIntyre, a Woodridge police officer and seven-time plunger. “The energy when we jump into the water, it compares to nothing else because we’re all here as volunteers. All proceeds benefit the 23,000 athletes and 20,000 young athletes of Special Olympics Illinois. The SUPER Plunge this year alone raised approximately $200,000. 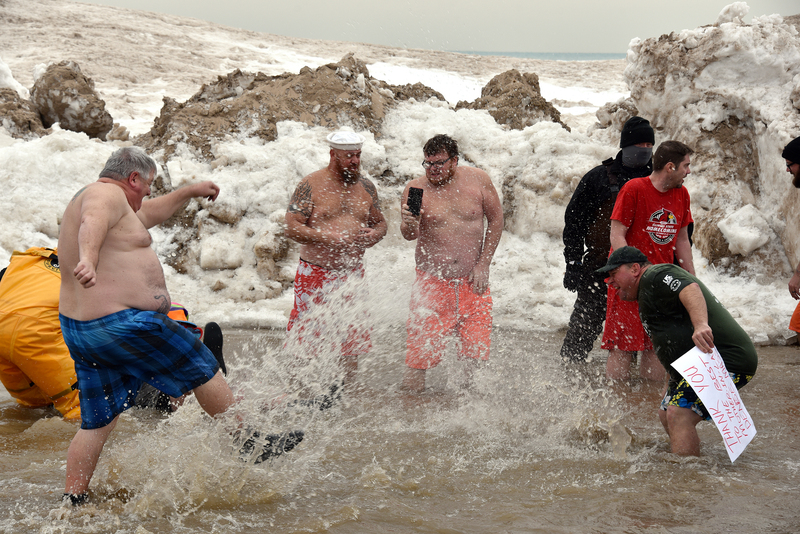 “It warms the body,” said a joking Dennis Reilly, a SUPER Plunger and Tinley Park police officer. Jack Klawitter, 12, a sixth-grader from Frankfort, participated with his parents Dave and Brook Klawitter. “Our son Jack has Down syndrome and we’ve been doing this for eight years,” Dave Klawitter said. “It’s raising dough,” Klawitter added, of one purpose of the event. 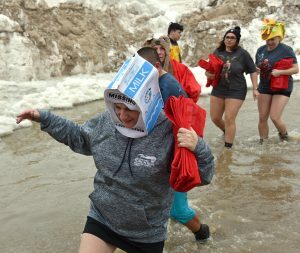 Saturday’s 9 a.m. plunge featured plungers donning crazy hats. On Friday, there was a friends and family plunge opportunity, and on Saturday at 10 a.m., the “Blackhawks Plunge Hour” where registrants could accompany SUPER Plungers. The extra registrants rounded out plunger participation to an estimated 80 people over the 24 hours. Tommy Hawk, the Chicago Blackhawks mascot, took a plunge with a hot pink flamingo float. “It’s as cold as it can be without being frozen,” said plunger Mary Pocuis of Glendale Heights. This is the 19th year of the Law Enforcement Torch Run Polar Plunge. More than 66,000 plungers have raised more than $18.4 million. The Law Enforcement Torch Run is the largest year-round fundraising vehicle benefiting Special Olympics Illinois. The Law Enforcement Torch Run has raised more than $47 million over 32 years to assist Special Olympics Illinois athletes. 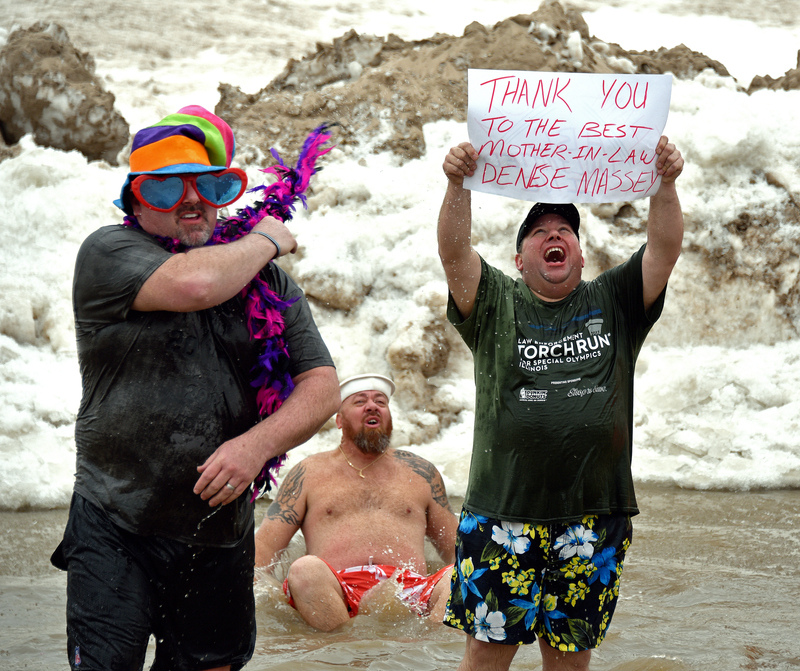 For Stephen Kretschmer of Bloomington doing the plunge sent a personal message. “The athletes respect us so much, it’s the least we can do for them,” said Kretschmer, who works at Logan Correctional Center. During one plunge, Kretschmer held up a sign to thank his mother-in-law for her sizable donation. Kretschmer said he raised an estimated $4,000. He had a shout out to his mother-in-law. “I love you, Dee.” Kretschmer said. 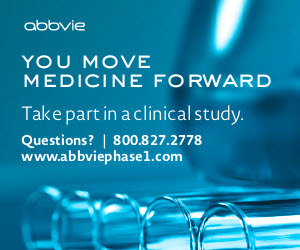 For more information, to register, or to support a plunger, visit www.plungeillinois.com.